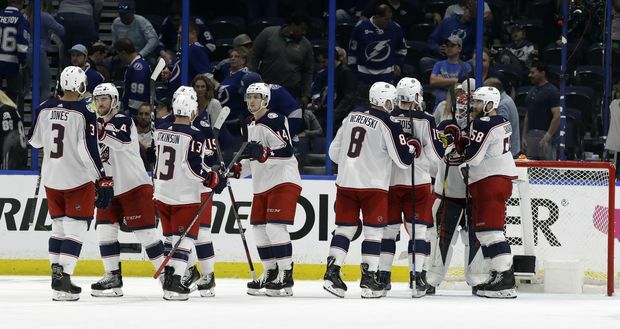 The Columbus Blue Jackets celebrate a win over the Tampa Bay Lightning during Game 2 of an NHL Eastern Conference first-round hockey playoff series on April 12, 2019, in Tampa, Fla.
Duchene assisted on both of Columbus’ goals during the first period and put the Blue Jackets ahead 3-0 on the power play when the centre scored on the rebound at 1:28 of the second after Vasilevskiy had stopped his tip-in try. Duchene’s four points set a team playoff record. ...The Lightning outscored Columbus 17-3 in sweeping all three games between the teams in the regular season. ... Tampa Bay D Anton Stralman (lower-body injury) sat out his third consecutive game, but took part in the morning skate. Cooper is non-committal about when Stralman will be back. ... Lightning RW Ryan Callahan and D Braydon Coburn were healthy scratches for the second straight game. ... Tampa Bay scored 325 goals in 2018-19, the most by any team in 23 years.